The article demonstrates how to use Web API Tracing, and trace the data using SLAB, in-process or out-of-process to a flat file or an Elasticsearch sink. Semantic.Logging from Enterprise Library now includes an Elasticsearch sink. The NuGet package also includes an implementation of the IExceptionLogger interface and a logging ActionFilter which logs the data using SLAB. This enables tracing for Web API and sets the custom SlabTraceWriter as the ITraceWriter. If you’re using SLAB OUT-OF-PROCESS logging, the application is ready. Now configure the SemanticLogging-svc.xml. 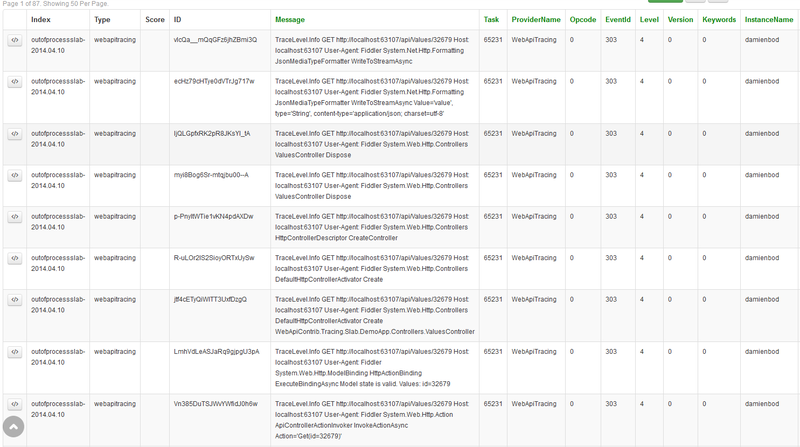 Underneath are examples for 2 sinks, an Elasticsearch sink and also a webapitracing.log flat file sink. If you’re logging in-process, add the following to your Global.asax. This adds a flat file listener for the WebApiTracing events. NOTE: NuGet package EnterpriseLibrary.SemanticLogging.TextFile is required for this. At present, the Event IDs are fixed from 301 to 306 for the default EventSource. The EventSource requires a RegisterLogger method. This method maps trace levels to your Events. This assembly contains 2 classes, one which implements the ITraceWriter from Web API and the EventSource. The SlabTraceWriter class maps the TraceLevel of the trace to an Action in the EventSource in the RegisterLogger method. When Web API sends a trace, the trace information is added to the message and logged. The EventSource class is used to log to the ETW. The Events are mapped to different trace levels. // Here you can log a resquest/response  messages. One or more errors occurred when loading the TraceEventService configuration file. The element ‘sinks’ has invalid child element ‘elasticsearchSink’. List of possible elements expected: ‘flatFileSink, rollingFlatFileSink, windowsAzureTableSink, sqlDatabaseSink, consoleSink, customSink’ as well as any element in namespace ‘##other’. With the latest version of SLAB you need to download the Elasticsearch sink and add it to the service.